FREE delivery on $50 minimum qualifying merchandise purchase. Valid for U.S. deliverable addresses only. Oversized and additional fees may apply. Not available to Corporate Outfitters. This offer can be used in combination with other promotions. Bass Pro Shops reserves the right to exclude certain products from this promotion. Free 2 Day delivery on $50 minimum qualifying merchandise purchase. Qualifying merchandise will upgrade to free 2-day shipping (Orders occurring over weekends and/or holidays may see extended delivery times). 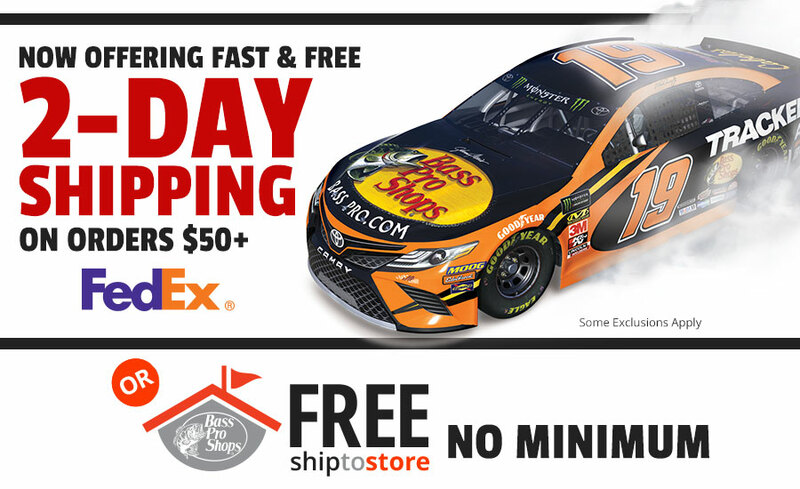 Non-qualifying merchandise will ship free Standard Express. Items that ship directly from the manufacturer, items on backorder, and purchased gift cards are excluded from qualifying merchandise. **Items not in stock (backorder) may not be purchased using the Stretch Your Payment Plan. Make sure your total merchandise selection equals $125 or more before adding shipping and taxes or after deducting any promotional discount, credits, and gift cards. When you have completed shopping continue through the checkout process. You will have the option to choose to Stretch Your Payments by clicking the box on the checkout payment page. Upon placing and the approval of your order for our Stretch Your Payments Plan, we will charge only one-fourth (1/4) of the total order amount to your VISA®, MASTERCARD®, or DISCOVER® card. The remaining balance of approved orders will be charged in three (3) equal installments every thirty (30) days from the date you place your order. If your order is not approved for our Stretch Your Payments Plan, you will be contacted before the order is processed. We reserve the right to check your credit score and history, which may delay this shipment of your order. If a subsequent payment declines, we reserve the right to attempt authorization daily for the past due payment(s). Overdraft and bank fees are not refundable. A credit will be posted to your Stretch Your Payments Account for any return or cancellations. Purchased gift cards and redemption of rewards points will be deducted from qualifying merchandise total. Gift cards and firearms are not eligible for the Stretch Your Payment Promotions. *Expiration date subject to change.